"Ahmad I" redirects here. For others named Ahmed I and Ahmad I, see Ahmad I (disambiguation). Ahmed I (Ottoman Turkish: احمد اول‎ Aḥmed-i evvel; Turkish: I. Ahmed; April 1590 – 22 November 1617) was the Sultan of the Ottoman Empire from 1603 until his death in 1617. Ahmed's reign is noteworthy for marking the end of the Ottoman tradition of royal fratricide; henceforth Ottoman rulers would no longer execute their brothers upon accession to the throne. He is also well known for his construction of the Blue Mosque, one of the most famous mosques in Turkey. Ahmed was probably born in April 1590 at the Manisa Palace, Manisa, when his father Şehzade Mehmed was still a prince and the governor of the Sanjak of Manisa. His mother was Handan Sultan. After his grandfather Murad III's death in 1595, his father came to Constantinople and ascended the throne as Sultan Mehmed III. Mehmed ordered the execution of nineteen of his own brothers and half brothers. Ahmed's elder brother Şehzade Mahmud was also executed by his father Mehmed on 7 June 1603, just before Mehmed's own death on 22 December 1603. Mahmud was buried along with his mother in a separate mausoleum built by Ahmed in Şehzade Mosque, Constantinople. Ahmed ascended the throne after his father's death in 1603, at the age of thirteen, when his powerful grandmother Safiye Sultan was still alive. A far lost uncle of Ahmed, Yahya, resented his accession to the throne and spent his life scheming to become Sultan. Ahmed broke with the traditional fratricide following previous enthronements and did not order the execution of his brother Mustafa. Instead Mustafa was sent to live at the old palace at Bayezit along with their grandmother Safiye Sultan. This was most likely due to Ahmed's young age - he had not yet demonstrated his ability to sire children, and Mustafa was then the only other candidate for the Ottoman throne. His brother's execution would have endangered the dynasty, and thus he was spared. In the earlier part of his reign Ahmed I showed decision and vigor, which were belied by his subsequent conduct. The wars in Hungary and Persia, which attended his accession, terminated unfavourably for the empire. Its prestige was further tarnished in the Treaty of Zsitvatorok, signed in 1606, whereby the annual tribute paid by Austria was abolished. Following the crushing defeat in the Ottoman–Safavid War (1603–18) against the neighbouring rivals Safavid Empire, led by Shah Abbas the Great, Georgia, Azerbaijan and other vast territories in the Caucasus were ceded back to Persia per the Treaty of Nasuh Pasha in 1612, territories that had been temporarily conquered in the Ottoman–Safavid War (1578–90). The new borders were drawn per the same line as confirmed in the Peace of Amasya of 1555. The Ottoman–Safavid War had begun shortly before the death of Ahmed's father Mehmed III. Upon ascending the throne, Ahmed I appointed Cigalazade Yusuf Sinan Pasha as the commander of the eastern army. The army marched from Constantinople on 15 June 1604, which was too late, and by the time it had arrived on the eastern front on 8 November 1604, the Safavid army had captured Yerevan and entered the Kars Eyalet, and could only be stopped in Akhaltsikhe. Despite the conditions being favourable, Sinan Pasha decided to stay for the winter in Van, but then marched to Erzurum to stop an incoming Safavid attack. This caused unrest within the army and the year was practically wasted for the Ottomans. In 1605, Sinan Pasha marched to take Tabriz, but the army was undermined by Köse Sefer Pasha, the Beylerbey of Erzurum, marching independently from Sinan Pasha and consequently being taken prisoner by the Safavids. The Ottoman army was routed at Urmia and had to flee firstly to Van and then to Diyarbekir. Here, Sinan Pasha sparked a rebellion by executing the Beylerbey of Aleppo, Canbulatoğlu Hüseyin Pasha, who had come to provide help, upon the pretext that he had arrived too late. He soon died himself and the Safavid army was able to capture Ganja, Shirvan and Shamakhi in Azerbaijan. The Long Turkish War between the Ottomans and the Habsburg Monarchy had been going on for over a decade by the time Ahmed ascended the throne. Grand Vizier Malkoç Ali Pasha marched to the western front from Constantinople on 3 June 1604 and arrived in Belgrade, but died there, so Lala Mehmed Pasha was appointed as the Grand Vizier and the commander of the western army. Under Mehmed Pasha, the western army recaptured Pest and Vác, but failed to capture Esztergom as the siege was lifted due to unfavourable weather and the objections of the soldiers. Meanwhile, the Prince of Transylvania, Stephen Bocskay, who struggled for the region's independence and had formerly supported the Habsburgs, sent a messenger to the Porte asking for help. Upon the promise of help, his forces also joined the Ottoman forces in Belgrade. With this help, the Ottoman army besieged Esztergom and captured it on 4 November 1605. Bocskai, with Ottoman help, captured Nové Zámky (Uyvar) and forces under Tiryaki Hasan Pasha took Veszprém and Palota. Sarhoş İbrahim Pasha, the Beylerbey of Nagykanizsa (Kanije), attacked the Austrian region of Istria. 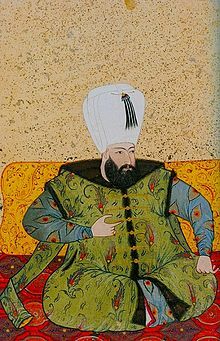 Ottoman miniature of Ahmed I. However, with Jelali revolts in Anatolia more dangerous than ever and a defeat in the eastern front, Mehmed Pasha was called to Constantinople. Mehmed Pasha suddenly died there, whilst preparing to leave for the east. Kuyucu Murad Pasha then negotiated the Peace of Zsitvatorok, which abolished the tribute of 30,000 ducats paid by Austria and addressed the Habsburg emperor as the equal of the Ottoman sultan. The Jelali revolts were a strong factor in the Ottomans' acceptance of the terms. This signaled the end of Ottoman growth in Europe. Resentment over the war with the Habsburgs and heavy taxation, along with the weakness of the Ottoman military response, combined to make the reign of Ahmed I the zenith of the Jelali revolts. Tavil Ahmed launched a revolt soon after the coronation of Ahmed I and defeated Nasuh Pasha and the Beylerbey of Anatolia, Kecdehan Ali Pasha. In 1605, Tavil Ahmed was offered the position of the Beylerbey of Shahrizor to stop his rebellion, but soon afterwards he went on to capture Harput. His son, Mehmed, obtained the governorship of Baghdad with a fake firman and defeated the forces of Nasuh Pasha sent to defeat him. Meanwhile, Canbulatoğlu Ali Pasha united his forces with the Druze Sheikh Ma'noğlu Fahreddin to defeat the Amir of Tripoli Seyfoğlu Yusuf. He went on to take control of the Adana area, forming an army and issuing coins. His forces routed the army of the newly appointed Beylerbey of Aleppo, Hüseyin Pasha. Grand Vizier Boşnak Dervish Mehmed Pasha was executed for the weakness he showed against the Jelalis. He was replaced by Kuyucu Murad Pasha, who marched to Syria with his forces to defeat the 30,000-strong rebel army with great difficulty, albeit with a decisive result, on 24 October 1607. Meanwhile, he pretended to forgive the rebels in Anatolia and appointed the rebel Kalenderoğlu, who was active in Manisa and Bursa, as the sanjakbey of Ankara. Baghdad was recaptured in 1607 as well. Canbulatoğlu Ali Pasha fled to Constantinople and asked for forgiveness from Ahmed I, who appointed him to Timişoara and later Belgrade, but then executed him due to his misrule there. Meanwhile, Kalenderoğlu was not allowed in the city by the people of Ankara and rebelled again, only to be crushed by Murad Pasha's forces. Kalenderoğlu ended up fleeing to Persia. Murad Pasha then suppressed some smaller revolts in Central Anatolia and suppressed other Jelali chiefs by inviting them to join the army. Due to the widespread violence of the Jelali revolts, a great number of people had fled their villages and a lot of villages were destroyed. Some military chiefs had claimed these abandoned villages as their property. This deprived the Porte of tax income and on 30 September 1609, Ahmed I issued a letter guaranteeing the rights of the villagers. He then worked on the resettlement of abandoned villages. The new Grand Vizier, Nasuh Pasha, did not want to fight with the Safavids. The Safavid Shah also sent a letter saying that he was willing to sign a peace, with which he would have to send 200 loads of silk every year to Constantinople. On 20 November 1612, the Treaty of Nasuh Pasha was signed, which ceded all the lands the Ottoman Empire had gained in the war of 1578–90 back to Persia and reinstated the 1555 boundaries. However, the peace ended in 1615 when the Shah did not send the 200 loads of silk. On 22 May 1615, Grand Vizier Öküz Mehmed Pasha was assigned to organize an attack on Persia. Mehmed Pasha delayed the attack till the next year, until when the Safavids made their preparations and attacked Ganja. In April 1616, Mehmed Pasha left Aleppo with a large army and marched to Yerevan, where he failed to take the city and withdrew to Erzurum. He was removed from his post and replaced by Damat Halil Pasha. Halil Pasha went for the winter to Diyarbekir, while the Khan of Crimea, Canibek Giray, attacked the areas of Ganja, Nakhichevan and Julfa. Ahmed I renewed trade treaties with England, France and Venice. In July 1612, the first ever trade treaty with the Dutch Republic was signed. He expanded the capitulations given to France, specifying that merchants from Spain, Ragusa, Genoa, Ancona and Florence could trade under the French flag. Sultan Ahmed constructed the Sultan Ahmed Mosque, the magnum opus of the Ottoman architecture,[according to whom?] across from the Hagia Sophia. The sultan attended the breaking of the ground with a golden pickaxe to begin the construction of the mosque complex. 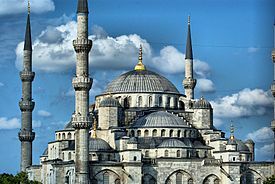 An incident nearly broke out after the sultan discovered that the Blue Mosque contained the same number of minarets as the grand mosque of Mecca. Ahmed became furious at this fault and became remorseful until the Shaykh-ul-Islam recommended that he should erect another minaret at the grand mosque of Mecca and the matter was solved. Ahmed became delightedly involved in the eleventh comprehensive renovations of the Kaaba, which had just been damaged by flooding. He sent craftsmen from Constantinople, and the golden rain gutter that kept rain from collecting on the roof of the Ka’ba was successfully renewed. It was again during the era of Sultan Ahmed that an iron web was placed inside the Zamzam Well in Mecca. The placement of this web about three feet below the water level was a response to lunatics who jumped into the well, imagining a promise of a heroic death. In Medina, the city of the Prophet Muhammad, a new pulpit made of white marble and shipped from Istanbul arrived in the mosque of the prophet and substituted the old, worn-out pulpit. It is also known that Sultan Ahmed erected two more mosques in Uskudar on the Asian side of Istanbul; however, neither of them has survived. Sultan Ahmed was known for his skills in fencing, poetry, horseback riding, and fluency in several languages. Ahmed was a poet who wrote a number of political and lyrical works under the name Bahti. But while supportive of poetry, he displayed an aversion to artistry and continued his father's neglect of miniature painting. This was connected to a devout religiosity that declared depiction of living things in art an immoral rivalry to Allah's creation. Accordingly, Ahmed patronized scholars, calligraphers, and pious men. Hence he commissioned a book entitled The Quintessence of Histories to be worked upon by calligraphers. He also attempted to enforce conformance to Islamic laws and traditions, restoring the old regulations that prohibited alcohol and he attempted to enforce attendance at Friday prayers and paying alms to the poor in the proper way. He was responsible for the destruction of the musical clock organ that Elizabeth I of England sent to the court during the reign of his father. The reason for this may have been Ahmed's religious objection to figurative art. Ahmed I died of typhus and gastric bleeding on 22 November 1617 at the Topkapı Palace, Istanbul. He was buried in Ahmed I Mausoleum, Sultan Ahmed Mosque. He was succeeded by his younger brother Şehzade Mustafa as Sultan Mustafa I. Later three of Ahmed's sons ascended to the throne: Osman II (r. 1618–22), Murad IV (r. 1623–40) and Ibrahim (r. 1640–48). Sultan Ibrahim (5 November 1615, Constantinople – murdered by janissaries, 18 August 1648, Constantinople, Topkapı Palace, buried in Mustafa I Mausoleum, Hagia Sophia Mosque), with Kösem, Sultan of the Ottoman Empire. Today, Ahmed I is remembered mainly for the construction of the Sultan Ahmed Mosque (also known as the Blue Mosque), one of the masterpieces of Islamic architecture. The area in Fatih around the Mosque is today called Sultanahmet. He died at Topkapı Palace in Constantinople and is buried in a mausoleum right outside the walls of the famous mosque. In the 2015 TV series Muhteşem Yüzyıl: Kösem, Ahmed I is portrayed by Turkish actor Ekin Koç. ^ a b Peirce, Leslie (1993). The Imperial Harem: Women and Sovereignty in the Ottoman Empire. Oxford University Press. p. 99. ISBN 0-19-508677-5. ^ Börekçi, Günhan. İnkırâzın Eşiğinde Bir Hanedan: III. Mehmed, I. Ahmed, I. Mustafa ve 17. Yüzyıl Osmanlı Siyasî Krizi - A Dynasty at the Threshold of Extinction: Mehmed III, Ahmed I, Mustafa I and the 17th-Century Ottoman Political Crisis. pp. 81 n. 75. ^ Börekçi, Günhan (2010). Factions And Favorites At The Courts Of Sultan Ahmed I (r. 1603-17) And His Immediate Predexessors. pp. 85 n. 17. ^ a b c d e f g h i j "Ahmed I" (PDF). İslam Ansiklopedisi. 1. Türk Diyanet Vakfı. 1989. pp. 30–33. ^ ''The Encyclopaedia of Islam: Fascicules 111-112 : Masrah Mawlid'' by Clifford Edmund Bosworth p.799. Books.google.com. Retrieved 2012-01-26. ^ "Figural Representation in Islamic Art | Thematic Essay | Heilbrunn Timeline of Art History | The Metropolitan Museum of Art". Metmuseum.org. Retrieved 2012-01-26. ^ Jardine, Lisa (2007-12-21). "UK | Magazine | An eye for detail". BBC News. Retrieved 2012-01-26. ^ a b c d e f g Şefika Şule Erçetin (November 28, 2016). Women Leaders in Chaotic Environments:Examinations of Leadership Using Complexity Theory. Springer. p. 77. ISBN 978-3-319-44758-2. ^ a b c d Mustafa Çağatay Uluçay (2011). Padışahların Kadınları ve Kızları. Ötüken, Ankara. p. 78. ISBN 978-9-754-37840-5. ^ Tezcan, Baki (2007). "The Debut of Kösem Sultan's Political Career". Turcica. Éditions Klincksieck. 39–40: 350–351. ^ a b c Mustafa Naima (1832). Annals of the Turkish Empire: From 1591 to 1659 ..., Volume 1. Oriental Translation Fund, & sold by J. Murray. pp. 452–3. ^ a b c d e Singh, Nagendra Kr (2000). International encyclopaedia of Islamic dynasties (reproduction of the article by M. Cavid Baysun "Kösem Walide or Kösem Sultan" in The Encyclopaedia of Islam vol V). Anmol Publications PVT. pp. 423–424. ISBN 81-261-0403-1. Through her beauty and intelligence, Kösem Walide was especially attractive to Ahmed I, and drew ahead of more senior wives in the palace. She bore the sultan four sons – Murad, Süleyman, Ibrahim and Kasim – and three daughters – 'Ayşe, Fatma and Djawharkhan. These daughters she subsequently used to consolidate her political influence by strategic marriages to different viziers. ^ Gülru Neci̇poğlu, Julia Bailey (2008). Frontiers of Islamic Art and Architecture: Essays in Celebration of Oleg Grabar's Eightieth Birthday ; the Aga Khan Program for Islamic Architecture Thirtieth Anniversary Special Volume. BRILL. p. 324. ISBN 978-9-004-17327-9. ^ Singh, Nagendra Kr (2000). International encyclopaedia of Islamic dynasties (reproduction of the article by M. Cavid Baysun "Kösem Walide or Kösem Sultan" in The Encyclopaedia of Islam vol V). Anmol Publications PVT. pp. 423–424. ISBN 81-261-0403-1. "Through her beauty and intelligence, Kösem Walide was especially attractive to Ahmed I, and drew ahead of more senior wives in the palace. She bore the sultan four sons – Murad, Süleyman, Ibrahim and Kasim – and three daughters – 'Ayşe, Fatma and Djawharkhan. These daughters she subsequently used to consolidate her political influence by strategic marriages to different viziers." ^ Uluçay 2011, p. 52. ^ Sakaoğlu, Necdet (2008). Bu mülkün kadın sultanları: Vâlide sultanlar, hâtunlar, hasekiler, kadınefendiler, sultanefendiler. Oğlak Yayıncılık. p. 235.